I synthesize all elements and create a personal vision that touches the intellect, heart and soul. I create art that is integrated in the overall building plan, enriches the culture of a community, and inspires the lives of future generations. With each commission I listen, allowing people to express their ideas, hopes and expectations. I believe the process of collaboration with committees, clients, architects, and/or contractors expands and enlightens the definition, design and development of the artwork. Analysis of the architectural plan and site-visits build an understanding of the light and its impact in the overall design. As a businesswoman and educator, I enjoy working with people, taking the time to explain the various options available in today’s glass art technologies. The use of traditional lead and hand-blown antique glass with brilliant hues and rich texture is an important aspect of my work. 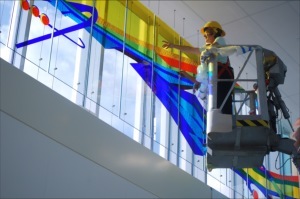 Stained glass can also be laminated to individual glass units and installed within the curtain wall or hung from steel cables. Plate glass can be laminated with antique hand-blown glass or hand painted with vitreous enamels and then fired for a permanent, more painterly stained glass effect. I have used all of these techniques and others in my commissioned work. With thirty years of experience in stained glass, I have the skill and ability to complete each aspect of any size commission. I remain personally involved as the project manager for each work and can hire, as needed, highly skilled art professionals, structural engineers and contracted specialists to assure the project is completed on time and on budget. Based on project requirements, I have also collaborated with other studios in the United States and Germany. To assure quality, digital layouts of each window are made to exact specifications. When necessary, a conservationist examines my entire plan from layout to final installation, so that each project is a success. 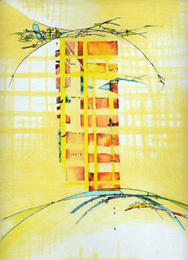 I design stained glass work for minimal future maintenance and create work that can last for the life of any building. Present sample materials of stained glass etc. Examples of our glass partners at work. We would meet or talk by phone and go over the requirements and details of the project. I would write up a detailed proposal covering the design, production and installation of the piece with specific costs and schedule.